David McLaughlin is a Memphian. David Graduated from Auburndale High School in 1985. He attended Christian Brothers University from 1985 to 1989, where he obtained his Bachelor of Science degree. While in college, he was a four-year letterman on the Buccaneer’s soccer team. After clerking for a law firm in college, he decided to pursue a law degree. He graduated from Cecil C. Humphrey’s School of Law at the University of Memphis in 1992, where he served as an editor on the Law Review. After law school, David’s law practice focused on civil litigation defense work centered around municipal liability, civil rights and personal injury. In 2001 David turned the focus of his practice to exclusively representing individuals who were injured by the negligence and wrong-doing of others. David previously practiced with some of the biggest law firms in the country that focused exclusively on helping injured people. 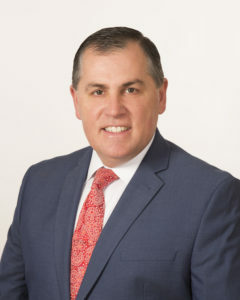 David has a wide array of litigation experience in Tennessee and Arkansas including matters dealing with wrongful death, personal injury, civil rights, medical devices, intellectual property theft and vaccine injuries. David echoes the sentiments of the late Jim Rhon who believed that we must all deal with one of two pains: the pain of discipline or the pain of regret. David chooses the pain of discipline as the only way to prepare a client’s case to ensure all possible avenues for recovery are explored so that there is no regret at the end of the matter. Knowing that the firm of Rainwater, Holt & Sexton has the same mindset about preparing clients’ cases made David’s association with the firm a natural fit. David lives in Germantown, Tennessee with his wife, Kim, daughter, Taylor, and son, Brady.